BAY OF CAMPECHE, Mexico (Dec. 7, 2016)- Ardent completed removing the Troll Solution jack-up in November, 2016; the largest wreck removal completed in 2016. 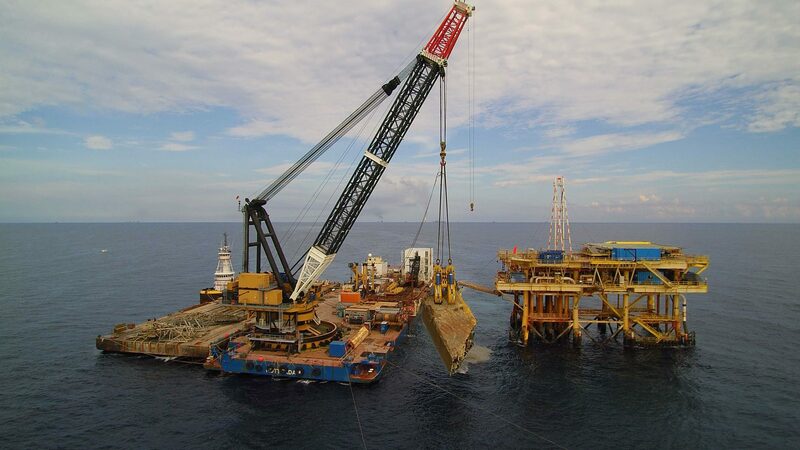 Weighing approximately 7,000 tons, the jack-up Troll Solution experienced a debilitating accident while carrying out maintenance work on the wellhead platform CAAN-A in 2015. Prior to Ardent’s involvement, efforts were made to refloat and salvage the jack-up. The Troll Solution collapsed and sank into the seabed in approximately 30m water depth. After sinking, the Troll Solution came to rest within two meters from the active CAAN-A platform. 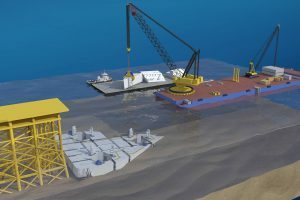 Ardent deployed assets from several countries, including the Conquest MB-1 crane barge, and a 1,000-ton hydraulic wreck grab from the Netherlands. Further support vessels were deployed from the U.S. and Mexico. 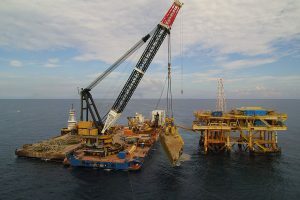 The Conquest MB-1 with a maximum of 1,400 tons lifting capacity has been previously deployed under Titan, Ardent’s pre-merger company, in support of the Costa Concordia removal in Italy. The operation used Ardent’s newly designed Guided Guillotine to dismember the jack-up, instead of cutting with more conventional methods. “Traditional methods require either a push or pull-cut with chains or diamond wire. 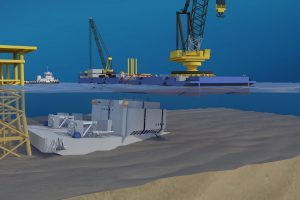 Pull-cuts require tunnels to be bored into the seabed, whereas push-cuts require a large framework to be built around,” said Ardent Naval Architect Roland De Marco. “The main hurdles to overcome were, how to best cut the jack-up into sections without fabricating an elaborate structure, and boring holes underneath the jack-up through the seabed was improbable due to obstructions,” said Shelby Harris, Ardent Americas Operations Director. “We had to apply ingenuity to use our chain cutting techniques on the deck house in a less than conventional method, and the Ardent Guided Guillotine sectioned the hull. The method worked very well,” said Harris. Conventional guillotine cutters are restricted to operations above the surface. The Ardent Guided Guillotine can function underwater with the precision to cut the Troll Solution jack-up into the required lift pieces. 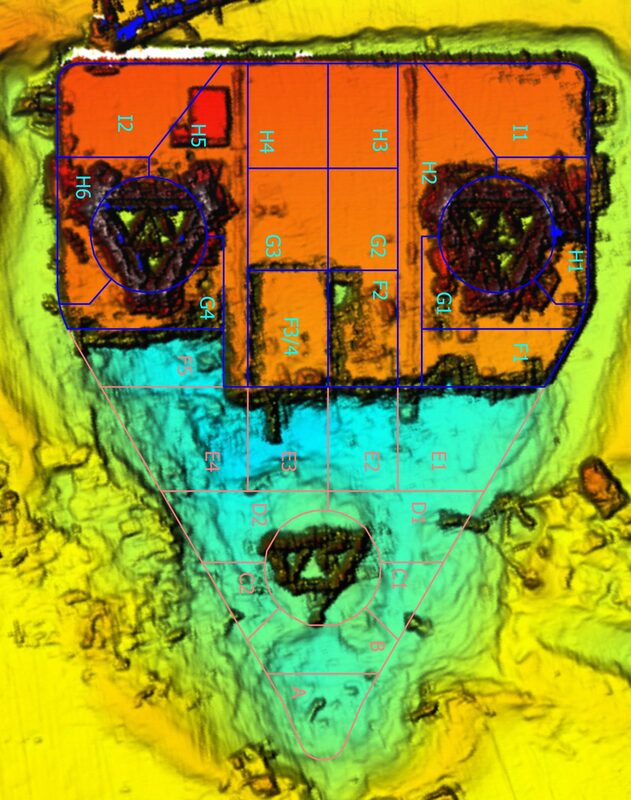 The Ardent salvage team cut the deck house into 6 pieces with Ardent Chain Pullers, and the vessel’s hull into 31 pieces with the Ardent Guided Guillotine and subsequently lifted these from the seabed with the Conquest MB-1 crane barge. 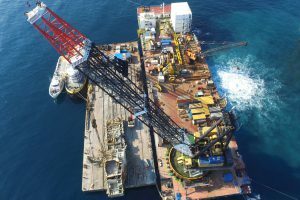 "This project showed the excellent integration of staff from both ex-Svitzer and ex-Titan team members, and further serves as a solid foundation for Ardent to continue progressing ahead,” said Peter Pietka, Ardent CEO. 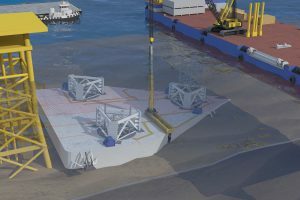 “We look forward to more challenges and collaboration with our partners in the offshore industry in the near future,” said Pietka. BAY OF CAMPECHE, Mexico (Nov. 15, 2016)- Ardent Naval Architect Roland De Marco walks in front of the bow piece of the Troll Solution after the salvage team cut and lifted it from the seabed. 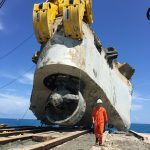 Ardent completed removing the Troll Solution jack-up in November, 2016; the largest wreck removal completed in 2016. BAY OF CAMPECHE, Mexico (Nov. 15, 2016)- Ardent completed removing the Troll Solution jack-up in November, 2016. This was the largest wreck removal operation in 2016. Ardent deployed assets from several countries, including the crane barge Conquest MB-1, and a 1,000-ton hydraulic wreck grab from the Netherlands. Further support vessels were deployed from the U.S. and Mexico. 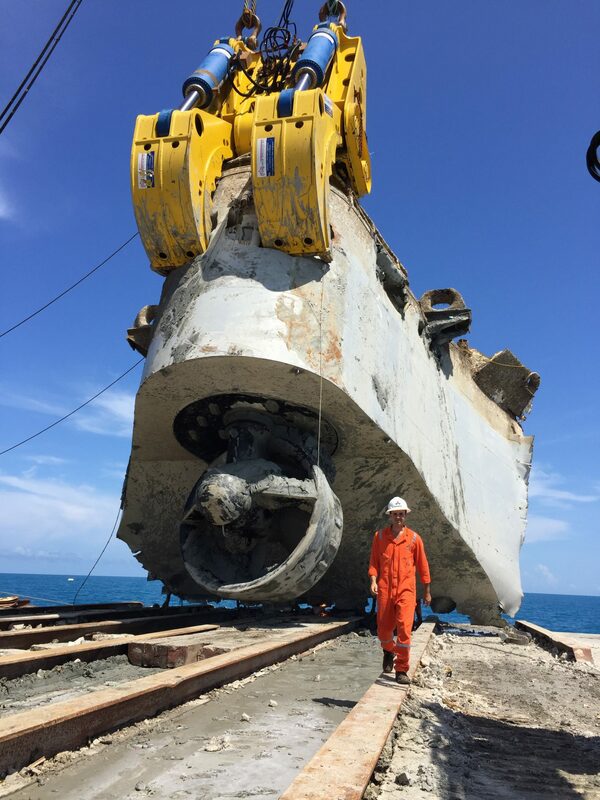 BAY OF CAMPECHE, Mexico (Nov. 15, 2016)- The Conquest MB-1 crane hoists a 600-ton piece of the Troll Solution jack-up wreckage from the Gulf of Mexico. Ardent completed removing the Troll Solution jack-up in November, 2016. This was the largest wreck removal operation in 2016. BAY OF CAMPECHE, Mexico – A computer generated image illustrates how Ardent planned to dismantle and dispose of the Troll Solution next to the active CAAN-A wellhead platform. 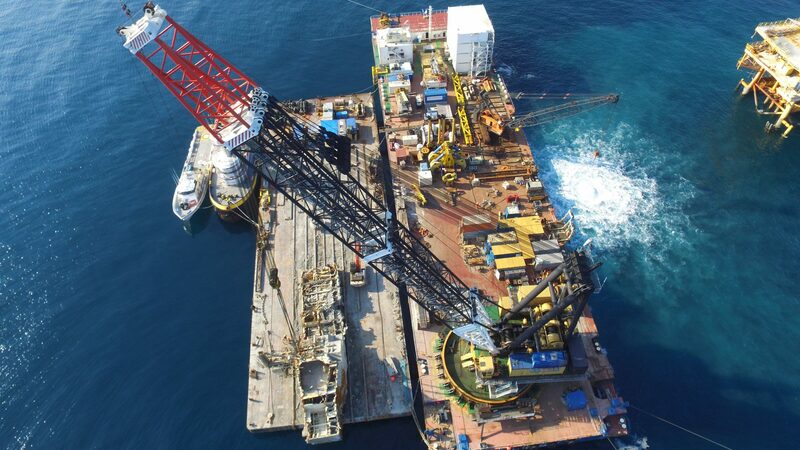 Ardent subsequently completed removing the Troll Solution jack-up in November, 2016; the largest wreck removal completed in 2016. 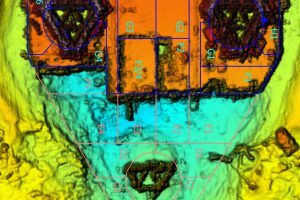 BAY OF CAMPECHE, Mexico (Nov. 15, 2016)- Ardent completed removing the Troll Solution jack-up in November, 2016; the largest wreck removal completed in 2016. A survey print-out shows removed sections of the Troll Solution jack-up as the wreck removal case was ongoing. Ardent is a leading marine & offshore services company, delivering effective and innovative solutions with a mind to minimize environmental impacts. We stand by our reputation and history of success in emergency management, wreck removal, and decommissioning. For more information please contact us at response@ardentglobal.com or media@ardentglobal.com.